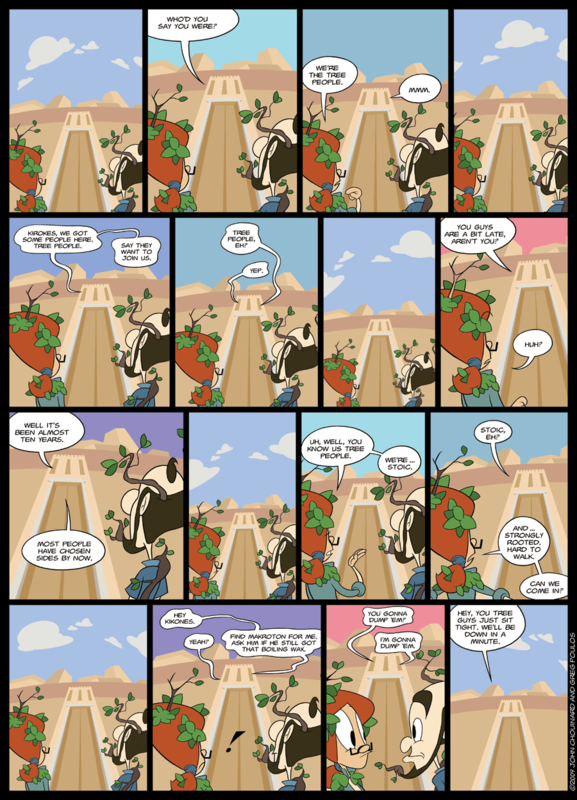 I am fight­ing the urge to say all sorts of things about this strip! Which runs a bit coun­ter­in­tu­itively to the con­cept of rantspace, but them’s the rolls, I sup­pose. Seems to be almost over, then. I don’t know what to say to that! ….and your father smelt of elder­berry! Well the least they could do is warn em about a cer­tain horse if the war’s almost over. Or they could find Cas­san­dra. Woah! The sky is pink in panels 8 and 15! I noticed the sky color too, regard­less of the intent it’s really inter­est­ing to con­sider how the colors make you feel about the tone of the con­ver­sa­tion, at that par­tic­u­lar point. I like how the clear blue matches the wait­ing scenes, while the dia­logue is paired with some color other than that. Also the clouds are moving; also, com­ments sec­tions make read­ing comic archives way more enjoyable/personal and help read­ers appre­ci­ate authors. I sup­pose it only works to a cer­tain extent of pop­u­lar­ity, but I like it.